In Florida, architect Chad Oppenheim has partnered with developer Terra and architect Roney J. Mateu on Botaniko Weston, an architect-designed planned community of just over 100 houses. 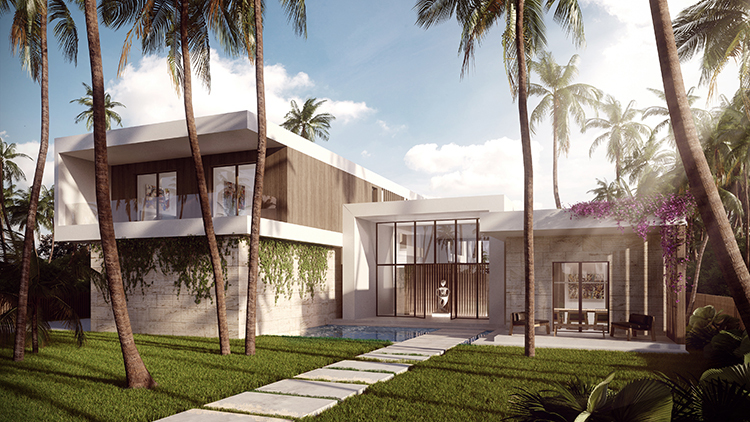 Oppenheim and Mateu each designed five residences for buyers to choose from. Oppenheim's offerings range from a four-bedroom at just over 4,000 square feet to a 7,200-square-foot six-bedroom. Each Oppenheim residence at Botaniko Weston features a modern interior design scheme by V Starr, the interior design firm led by Venus Williams. Since the birth of the Levittown, the concept of the suburb has been hotly debated. These quintessential American communities purport to offer safety, space, and good schools, but sometimes such conveniences can come at the cost of individuality and attention to design. Now, architects are looking to change that paradigm by taking elements of high-end architecture and imparting them on the neighborhood scale, proving that surban architecture doesn't have to be boring. At Dwell on Design New York, architect Chad Oppenheim of Oppenheim Architecture + Design will reveal his vision for the neighborhood of the future: Botaniko Weston. Learn more about this project, and what suburban architecture can take from the urban environment in the discussion "Reinventing the Suburb with Chad Oppenheim" on Saturday, October 3, at 2:45 p.m.
Dwell on Design New York takes place at Skylight Clarkson Sq from Oct. 2-4, and features three days of stimulating discussions with industry leaders. Get your tickets now to join us for the show. For a full list of panelists, see this page of Dwell on Design New York's website.